Mardi Gras and King Cakes go together like beads and parades, but sometimes it can be hard to get a traditional Mardi Gras King Cake. If this is the case for you, don't let that spoil the fun! Inspired by the current gourmet cupcake craze and our traditional Mardi Gras King Cake, we created a gourmet Mardi Gras king cake cupcake that you can enjoy no matter where you live. With simple ingredients like, vanilla wafers and icing, you can create these tiny cookie Mardi Gras king cakes. They fit perfectly on top of a cupcake. With a tiny king cake and king cake baby on top, these Mardi Gras cupcakes are great for Mardi Gras parties any time of year. But with Mardi Gras just days away, these cupcakes are a great way to bring the Mardi Gras King Cake tradition to you. While our king cake cupcakes are definitely more cake than traditional king cake (which is more of a cinnamon roll), they do contain a special surprise just like a traditional Louisiana style Mardi Gras King cake. A tiny plastic baby is usually hidden in a king cake. This surprise that awaits someone in a piece of king cake is supposed to symbolizes the baby Jesus. Tradition dictates that the person blessed with the king cake baby hosts the next king cake party or brings the next king cake to work, school or meeting. In our version, everyone gets a special King Cake baby (on top), but only one person gets the special surprise treat. In one cupcake is a chocolate candy center. How fun! Whoever gets the chocolate center cupcake can host the next party! The tiny plastic king cake babies are not safe to bake in the king cake. They would melt. The king cake babies are traditionally added after the cake is baked by inserting them in the bottom. A piece of candy or other edible treat is a better choice for cupcakes. For more information on the history and traditions surrounding King cakes and King cake babies see this post on, Twelfth night traditions or our About Mardi Gras page. For even more Louisiana Recipes, visit our Recipes page. Use any flavor cake/cupcake batter you prefer. We chose a basic vanilla cake mix and added a touch of cinnamon to mimic the cinnamon flavor of a traditional king cake. To create the "king cake" surprise, drop a chocolate "kiss" into one lucky cupcake. As it bakes it will sink so ideally you want it just on the top of the batter. Our simple un-iced cinnamon cupcakes. To create our tiny cookie king cakes, we used plain vanilla wafers. Icing transforms these cookies from plain vanilla wafers to mini king cakes. Step1: Using white icing, create a circle around the edge of the cookie. Step 2: With purple, green and yellow icing, add a rectangle section of each color icing. Step 3: Continue around the king cake, mimicking the colored icing/sprinkles on a traditional king cake. Step 4: Finish the cookie off with some edible sprinkles. With a small amount of icing, add the plastic king cake baby to the center of the cookie. Place your mini king cake cookie on the top of your cupcake. Not only are these king cake cupcakes cute but the yummy cookie king cake is edible as well. And your guests will love breaking into their cupcakes to see who got the prized cupcake. Create a new Mardi Gras tradition in your area! 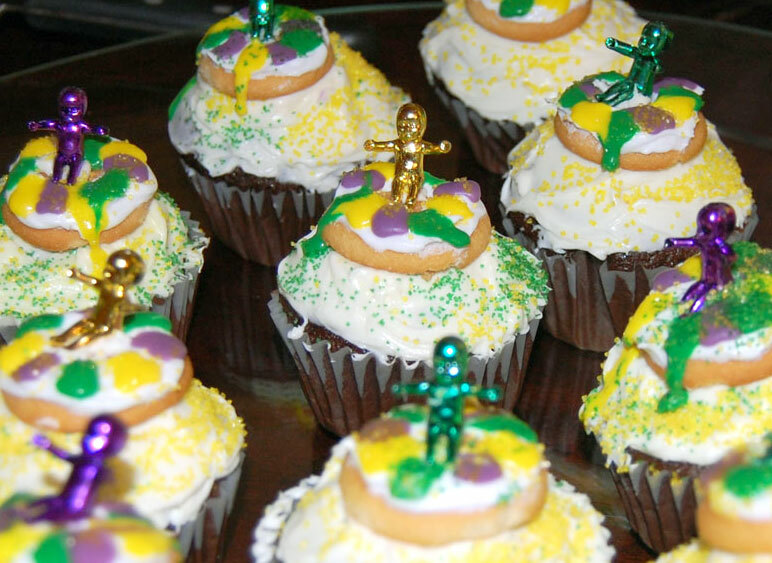 Host a Mardi Gras party and serve these King Cake cupcakes. You never know who will get the prize cupcake and host the next event. What fun! So good! I am making King Cake, but this is cute, too! And nice!